Person Pitch, Panda Bear’s third solo album, is a rather more luxurious and vibrant affair than its predecessors. While his 1997 eponymous lo-fi debut refused to decide between Casio-style knob tweaking and folk songs, its follow up, Young Prayer, released in 2004, dedicated to his recently deceased father, was much more sombre and atmospheric. 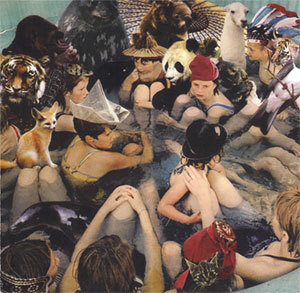 In the last year, Panda Bear, real name Noah Lennox, got married, became a father and moved to Lisbon, where the album was recorded. On this latest opus, he lets loose and assembles a magnificent collection of uplifting and gently psychedelic avant pop. Largely influenced by the vocal layering of Brian Wilson and the Beach Boys, especially on opener Comfy In Nautica and on the epic Bros, Noah Lennox is in fine form here, crafting beautiful melodies and arrangements which, while retaining some of the lo-fi essence that informed early Animal Collective albums, and his own, benefit from a more elaborate production. The rhythms are often tribal and the guitars hypnotic, with additional found sounds and electronics bringing unusual textures. The voice never appears entirely in focus and is often placed slightly at the back of the spectrum, making the lyrics slightly mysterious, as caught up in fog. This will be familiar sonic territory for Animal Collective fans, and it undeniably gives a strong hint as to what is Lennox’s contribution to the band, especially on their last two records. Yet, without the radical vision of Avey Tare, Lennox is free to let the music flow freely, and it shows. Not able to contempt with just one main theme for each song, Lennox changes focus halfway on more than one track. Take Pills, Bros and Good Girls/Carrots in particular seem as made of two or more songs welded together. In the case of the latter, it is perhaps because Good Girls and Carrots are actually independent songs, but they morph into one another in such a way that they become part of the same entity. Beside the grandeur of these, Lennox also drops a couple of atmospheric pieces with the slow burning melody and kaleidoscopic backdrop of the moving Im Not and the introspective ambient sonic cloud of Search For Delicious. The album concludes on a delightful note with the slightly melancholic Ponytail. With the next Animal Collective album due later this summer and Avey Tare’s collaboration with former Múm vocalist Kria Brekkan delving into much more experimental territories, Panda Bear offers on Person Pitch a series of beautiful songs. His music is much more confident than on previous solo outings, yet, he retains the innocence and spontaneity that have characterised his work to date, ensuring that this album is as refreshing and exhilarating as a summer shower at the end of a stormy day.